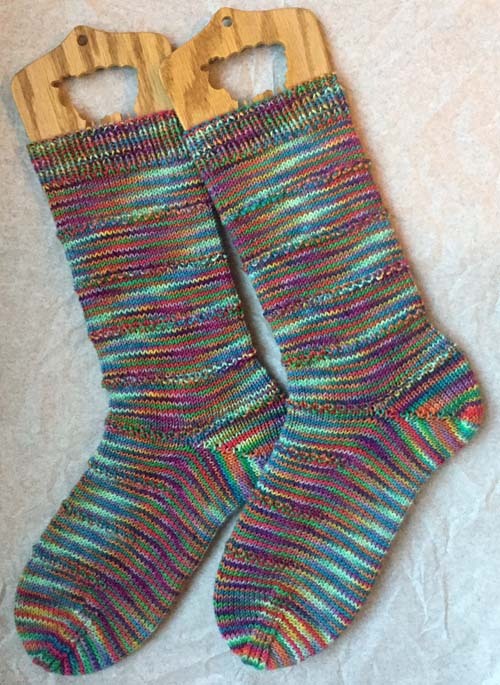 It's time for me to get caught up on the socks I've finished in the past couple of months. First up are the socks for August, using the exclusive colorways from The Loopy Ewe in Fort Collins, CO.
Pattern: Cast on 60 sts, 1x1 ribbing, stocking stitch leg and foot, short row heel, shaped toe. In order to help break up any potential pooling I purled every 14th and 15th rounds on the leg and top of the foot. Each month The Loopy Ewe offers an exclusive colorway. This one is from August, 2016.